AccessJ: Want a Japanese Penpal? Here's How to Find and Make One. Want a Japanese Penpal? Here's How to Find and Make One. Pen-pals can be an awesome way to practice Japanese or learn about Japan. If you're moving into a new city, you can connect with people there beforehand. And, it seems like there's no shortage of English teachers in Japan who never get to talk to Japanese people outside of work. Pen-pals can be a nice self-confidence boost if you get to Japan and realize that you've 1) left all your old friends behind, and 2) are having trouble making new friends here--especially Japanese ones. 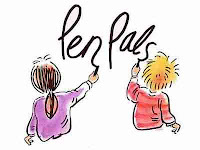 A lot of sites advertise pen-pal matching services for a fee. (And they usually do it right alongside dating services.) But, you don't need to pay money to find quality networks of people who want to practice their English, listen while you practice Japanese, or make a genuine friend. My top recommendation for pen-pal networking is Japan Guide. The forums of the site are well-concealed, and maybe that is what's saved the completely free-to-use site from being infested with jerks and scams. To use it, follow the links to the "Classifieds" or "Members' Area" at the bottom-right corner of the main page. The most active classifieds forum is the board for finding friends or pen pals, and they have a range of nationalities on the site. You can search by languages spoken, age, or region. Another fantastic site, though in a little different vein, is Lang-8. Lang-8 is a blogging site aimed at people who want to write their blog in a non-native language. You open up a Facebook-style page there and write blog entries on the page. Native speakers of the language you wrote in can browse recent entries and comment on them or correct your mistakes using a very intuitive editing system. As an English speaker, you will be in high demand to check other peoples' blog entries. And the Japanese community there is very active. Once you've established yourself on the site with a few entries of your own and contributions to others, people are more than happy to help out with homework questions, etc. Like Facebook, you can mark other users as friends, which makes sure their blog entries will always appear in your feed. I made some solid friends here after we checked each other's blog entries over several months. And in that way, I think Lang-8 is the perfect platform to make some pen-pals who will last. Of course, even if you send out a bunch of messages on one of these sites, maybe you'll find that not many people reply, or people that initially seemed excited to contact you suddenly dropped off the face of the Earth. There's some skill involved in keeping a pen-pal relationship going; in our next post, I'll offer some of my opinions about how to do it. I'm glad you mentioned Lang-8. I like that it revolves around learning and practice and that's exactly what everyone else is there to do. This makes the users serious about study, yet compassionate and friendly. It's also like having 10 penpals, at one time.